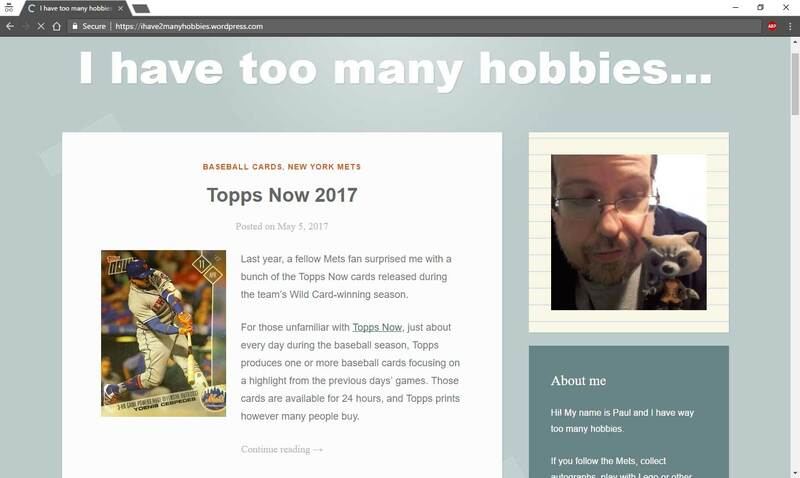 In yesterday's post I mentioned that I am no longer interested in Topps Chrome. 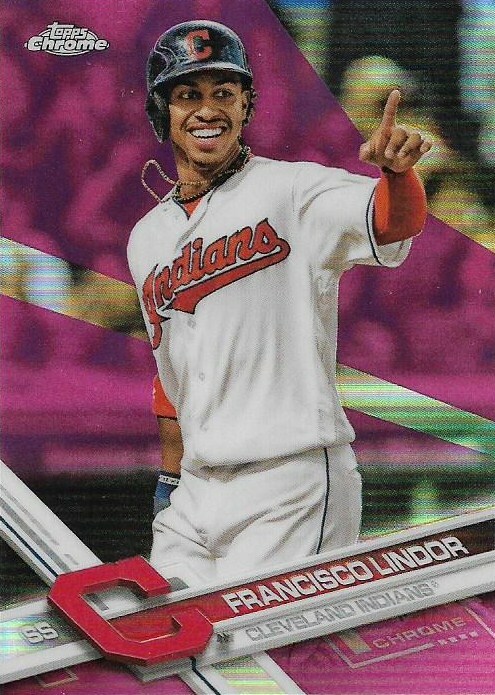 The removal of borders essentially ruined the brand for me (it hasn't helped much with flagship either). But that doesn't mean I can't buy a pack. 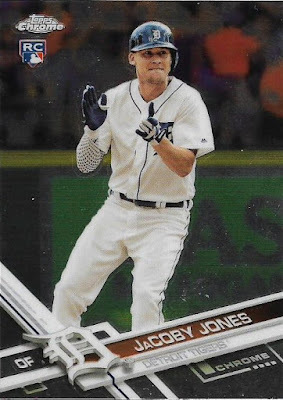 I had not been to a card aisle in Target or Walmart in nearly a month. I hadn't even been in any other part of either store. It felt good. There weren't any cravings. I knew what was on the shelves. It didn't interest me. Even the urge to rip wasn't there. Ah, but addiction has its ways. 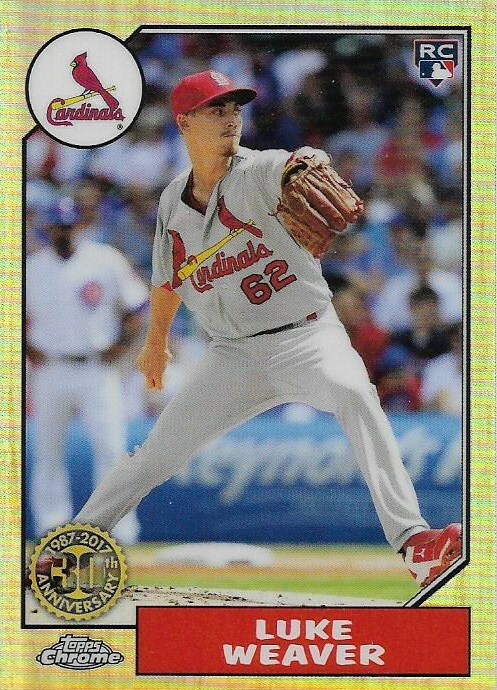 While running around trying to find food that two 19-year-old girls would eat for dinner, this suddenly popped in my brain: "Hey, I haven't bought any cards at the store in awhile." It sounded very logical. Rational even. I've been a good boy. It's been many weeks. Surely a few cards after a month wouldn't be an issue. You could even buy 15 cards for $9.98. Who would care? I was back under the spell. Walmart was a disaster. Apparently in the month that I had been away, the store had decided to return to its 2009 state and impress me with football and wrestling packs. On to Target I went. 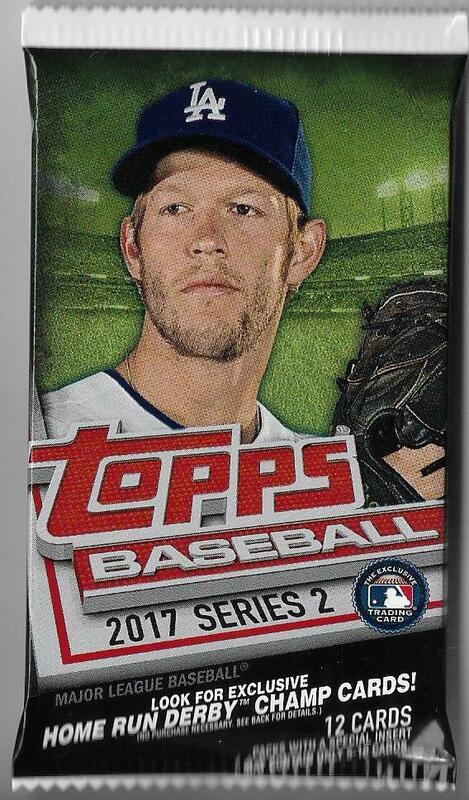 At Target I noticed the repacks (I bought one) and I saw 2017 Chrome for the first time. On one of those 3-pack hangers was a sticker that said "get one free pack of Topps Series 2." Well, all right. 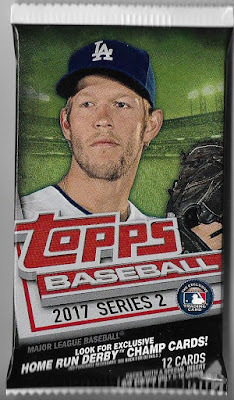 I don't give a snivel about Topps Series 2, but free is free. Sign me up. I opened the Series 2 pack ready to be disappointed. Sensing this, the Series 2 pack responded with a pack spilling over with Tampa Bay Rays. One card in the entire pack interested me. I appreciate any card that reminds people of the greatness of 1970s baseball. So, then I turned my attention to the Chrome packs. These, in all honesty, were not exciting. 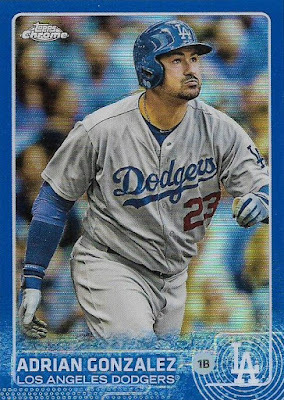 And that's a terrible indictment of Chrome, considering the many panting odes I've made to opening packs of Chrome in the past. I do not understand these at all. This looks like an unfinished baseball card. I want a completed card, not a ghostly representation of a card. 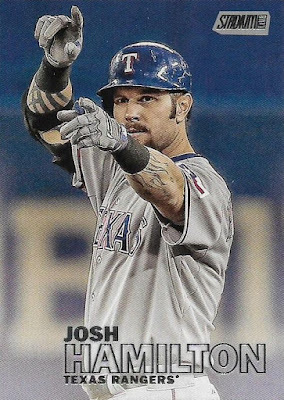 Topps sure likes this guy this year. Not as much as it likes 1987 Topps, but I still haven't figured out who he is. 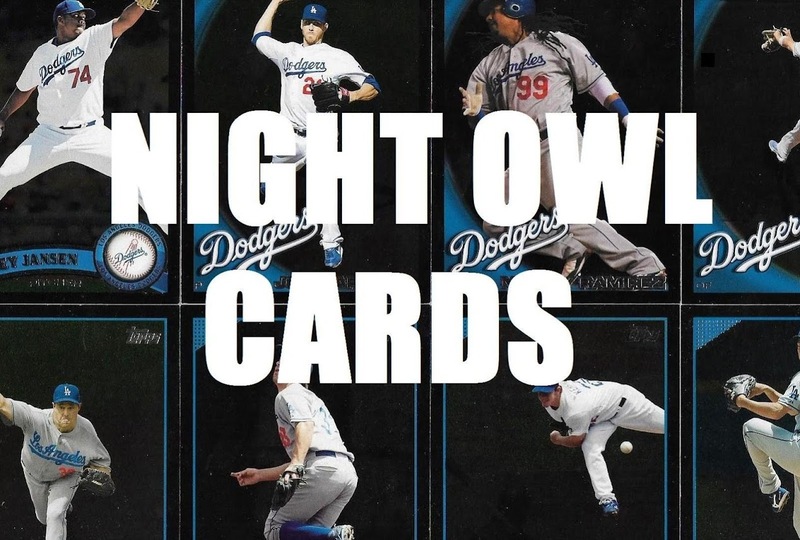 The Dodgers suddenly have starting pitching problems. But I did get a Dodger! Anyone else see the Creature From the Black Lagoon lurking in the background? 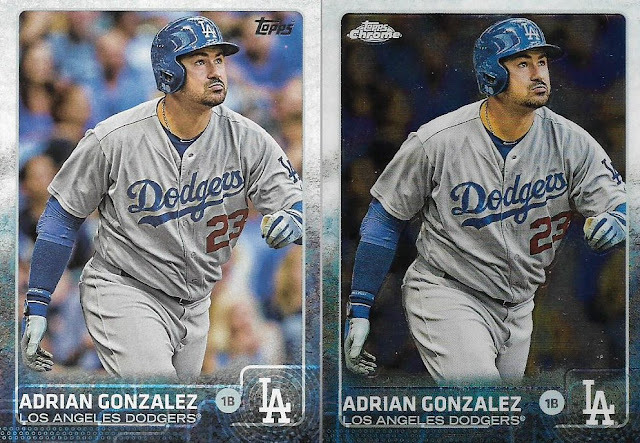 Hey, two Dodgers! This was smart spending after all. Every one of these comes with three pink parallels. Parallels these days mean giant pink streaks covering the background that makes the card look like an unfinished paint project. I would prefer that the entire background was pink, but I'm sure I'm being too logical. 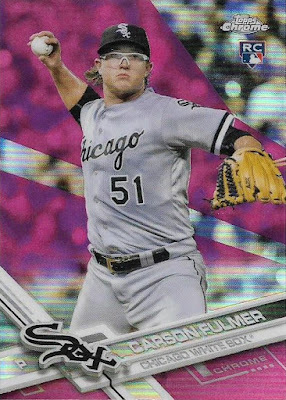 Outside of Fulmer, who is another player that Topps forces on us despite his 40.50 ERA this year and virtually nothing else of major league consequence, those were pretty good pinkies. 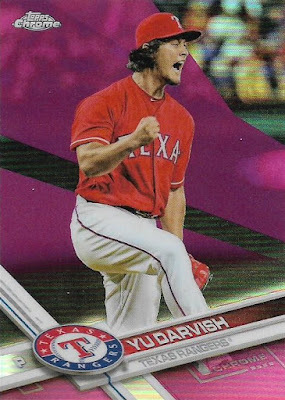 I can pretty much guarantee that will be my last 2017 Chrome purchase of the year. The spell may not be fully broken. But I know when the spark is gone. U2's "The Joshua Tree 2017 Tour" is stopping in the Buffalo area next Tuesday. It would have been a prime opportunity to witness in person what I would say is my all-time favorite group and all-time favorite album, if I was forced to name something like that. However, that Tuesday I will be busy. I have a doctor's appointment and then a night of work. I can't say it's completely heartbreaking as we have access to concerts in our very own home these days and I watched the entire Joshua Tree '17 concert a few months ago (I don't remember where it took place). It was terrific. When I watched the concert, the songs didn't hit me quite the same way as they did in 1987. I am not the same person I was in 1987 -- I was young and ready to change the world as many college-age people are. But I still felt at one with everything on that album. This is the sweet spot for me in music, in terms of sound, mood and lyrics. I've gone through my connection with U2 before (on the 25th anniversary of the album), so I'll keep this brief. I was a fan of U2 from the time of "War," when I first heard "New Year's Day" on 99.9 FM, the WAAL, in the winter of 1983. 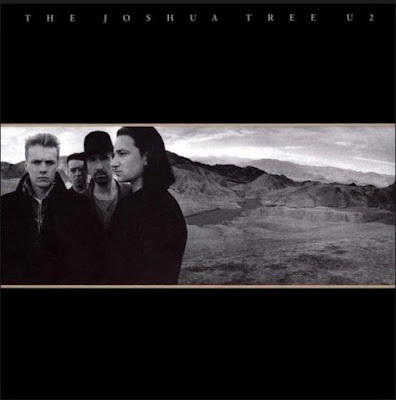 And my devotion grew, until The Joshua Tree hit and then everyone knew. And I said, "See? Great isn't it?" U2 was never as fantastic as they were during The Joshua Tree, although I remained a fan through much of the '90s and early 2000s. It's now 30 years later and you can find all kinds of U2 haters. I chalk that up to a generational thing and a current world in which everyone has to dismiss everything. All I have to say to that is: you missed out. It was phenomenal. A wave surging over millions. And the album remains a regular entry in critics' lists of the all-time greatest. To recognize the 30th anniversary in my own way, I'm doing my first Match the Song Title post in a year and a half. This is where I attempt to find a card that connects with the title of the song. In some cases I go with the meaning of the song, but that can get messy (in this album's case, the topics are very heavy). But first, the song list. 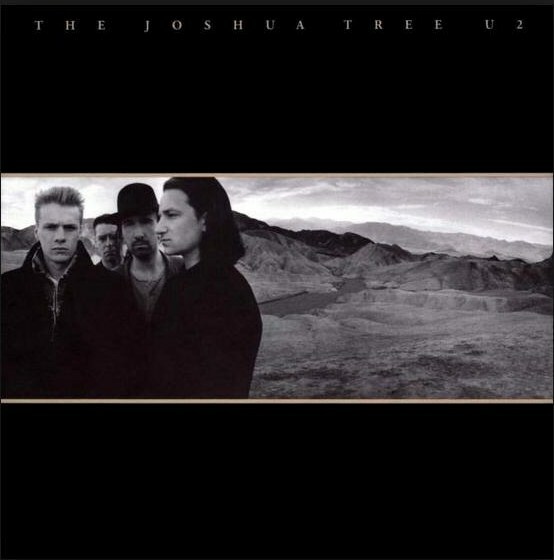 Match the song title: "The Joshua Tree, U2"
Track 1: Where the Streets Have No Name: A song about how a place -- where you live -- can define how people perceive and treat you. 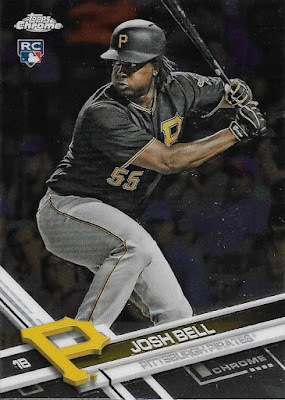 For baseball card purposes, I took it to mean someone coming from a tiny place to play baseball, like Curacao. 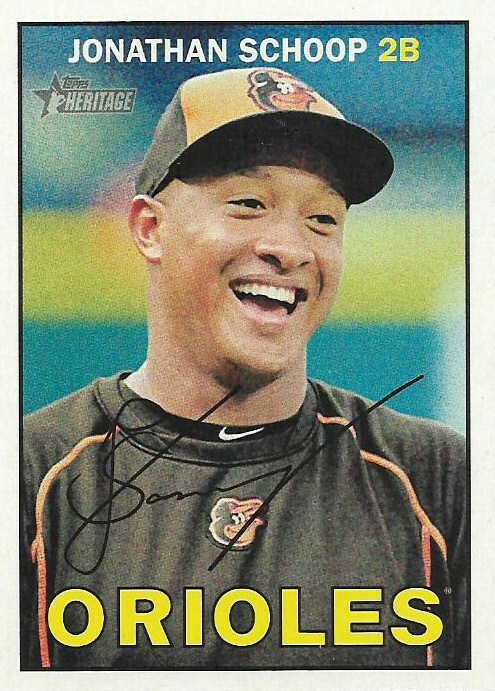 Jonathan Schoop is one of several major leaguers from the tiny island off of Venezuela. However, it does have street names. Many of which feature double a's or double e's. Track 2: I Still Haven't Found What I'm Looking For: My Nebulous 9 list enjoys quite a bit of turnover. But there are some cards that stay on there for months. This particular one has remained there for an annoying period. 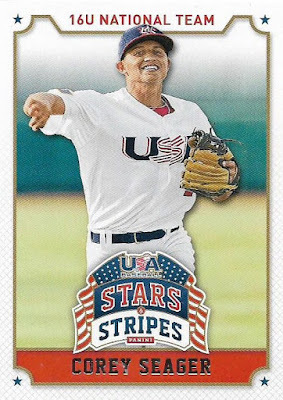 It's a Toppstown card from 2011 Update. It's worth almost zip, but since everyone sells 2011 Update for crazy prices, I can't find it. 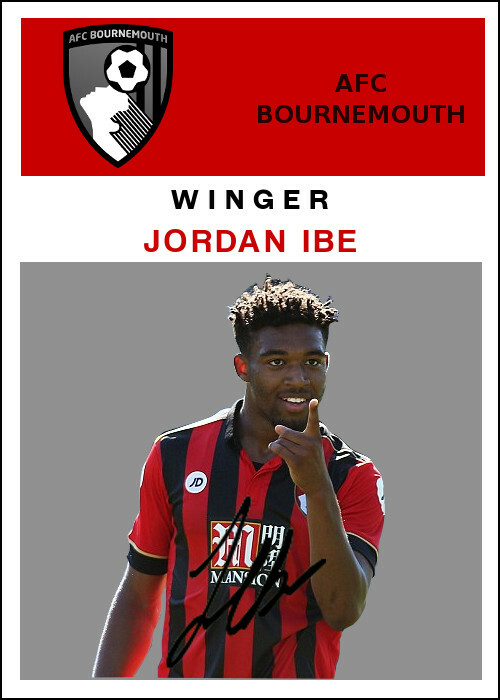 The above image is the only one I could find, being sold on ebay. So, I guess I have found what I'm looking for. (Unfortunately the card doesn't look as cool as the image). 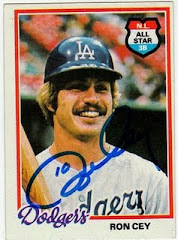 Track 3: With or Without You: A love song, which means I automatically think of Topps Chrome. Before Chrome went to no borders (and ended its appeal for me), I'd buy it feeling both enthusiasm and shame at the same time. Why was I buying cards that looked the same as cards already issued? And I'd look at them after I bought them and think, "why do I have these?" However, the colored borders -- oh, the colored borders -- change everything. How can I not love that? I need that. 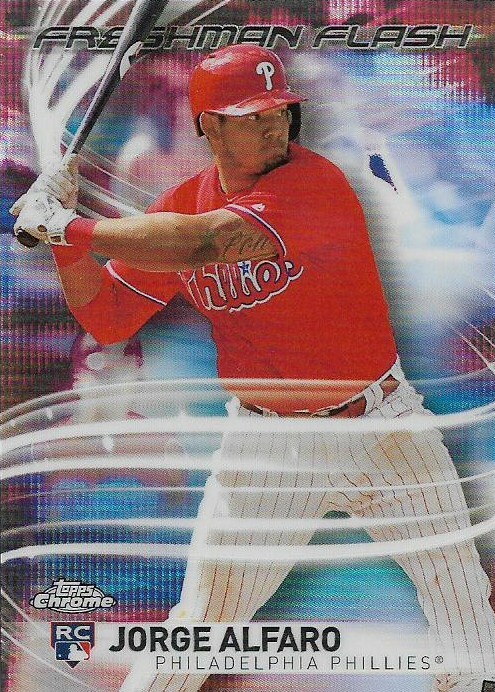 So there you go, Topps Chrome, I can't live with or without you. Track 4: Bullet the Blue Sky: An overtly political song and a good example of Bono's sometimes heavy-handed treatment of such topics, although I appreciate his heart greatly. 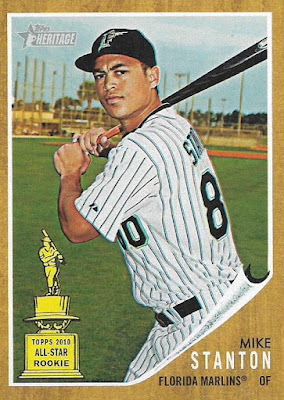 I'll stick to baseball and ask whether Giancarlo "Mike" Stanton has hit a home run today? 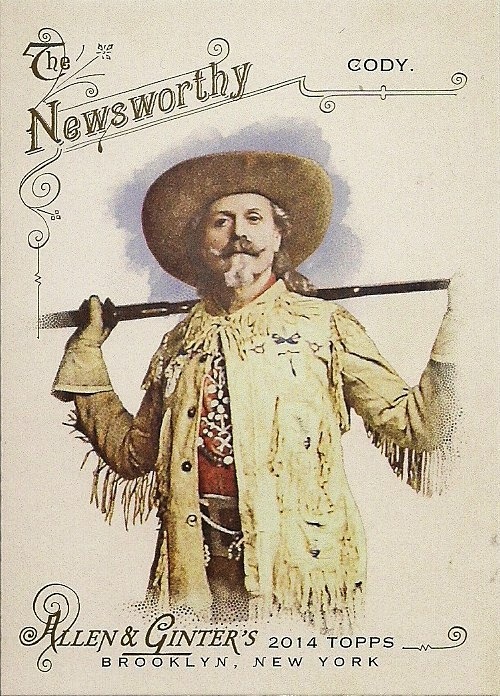 He's been sending bullets through the blue sky on a daily basis this month. Track 5: Running To Stand Still: A song about a heroin-addicted couple. Josh Hamilton is the only major league player I know who's had a heroin problem. Track 6: Red Hill Mining Town: Since U2 is playing every song on the album on this tour, this marks the first time they've played "Red Hill Mining Town" in concert. 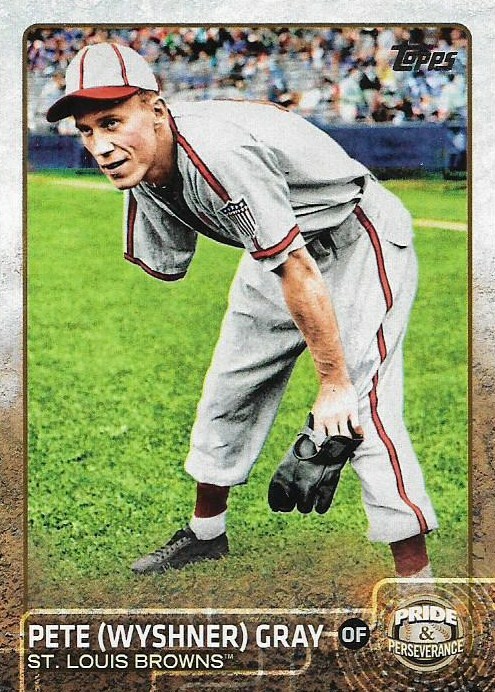 Pete Gray was from the mining town of Nanticoke, Pa. He lost his right arm in a truck accident when he was 8. Track 7: In God's Country: Bono's been quoted as saying this song could be about America or Ireland. 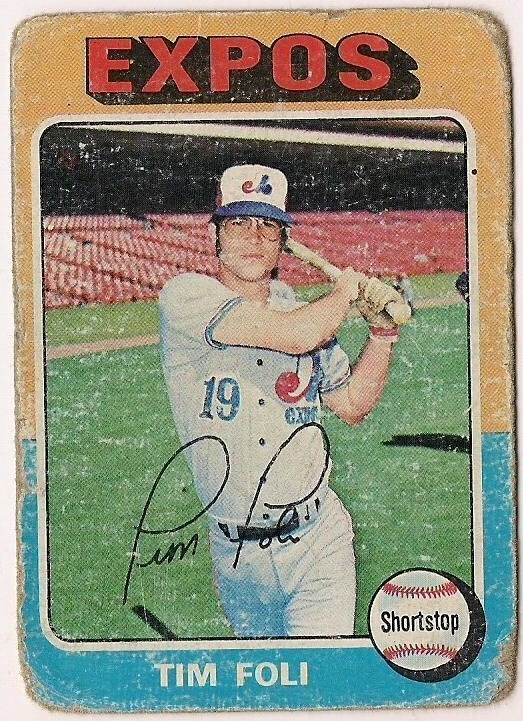 P.J. 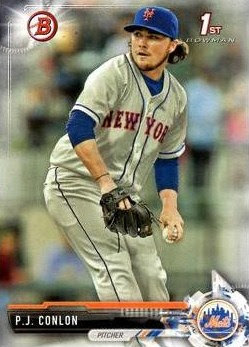 Conlon, a Mets prospect, is from Belfast, Northern Ireland. If he makes the majors, he'll be the first Irish native to play big league ball since the 1940s. 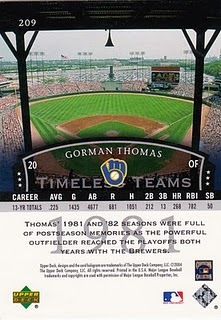 Track 8: Trip Through Your Wires: In major league baseball, "wire" means only one thing and that's the waiver wire. Recently there was one of those lists ranking the all-time greatest waiver wire deals. The Braves snagging John Smoltz from a pennant-desperate Tigers team in exchange for veteran pitcher Doyle Alexander was named the greatest of them all. Track 9: One Tree Hill: A gut-wrenching song that I could never match with a baseball card. However, there is a famous TV series by the same name that I've never watched. 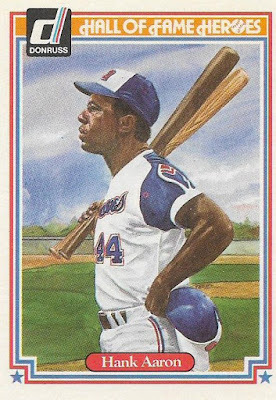 One of the creators and producers of that show is Mike Tollin, who also created a documentary on Hank Aaron in the mid-1990s. 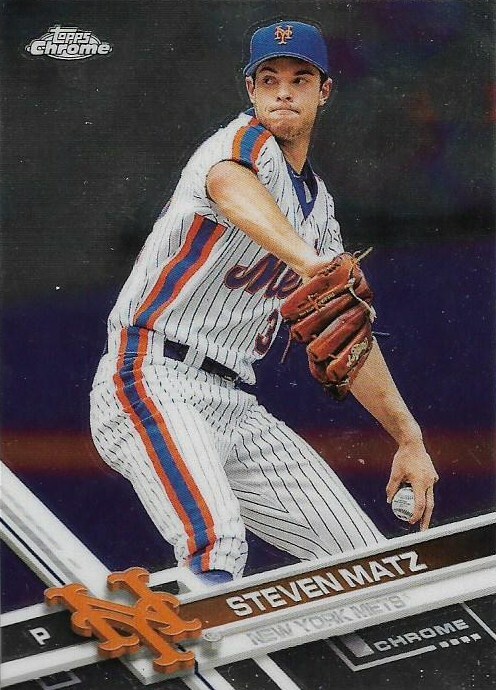 By the way, I tried to track down my Leaf card of Aaron from 1987, since that was also issued 30 years ago. But I couldn't find it. 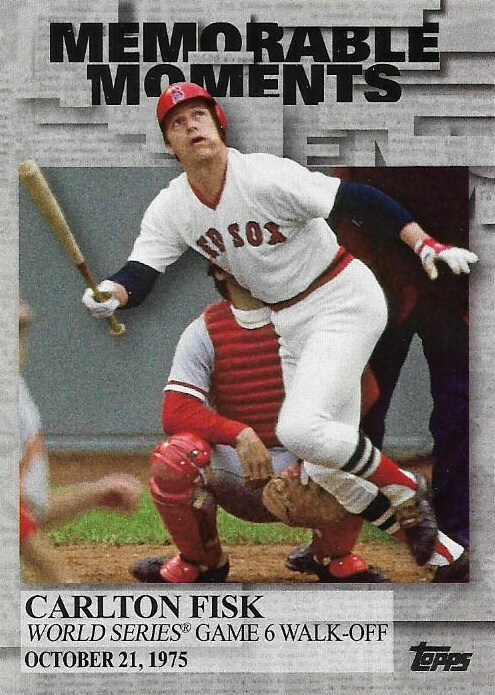 So I'm using this Donruss Hall of Fame Heroes Hank from four years earlier, that features the exact same picture. Track 10: Exit: A song about a serial killer, so let's go with the title! I don't know a greater final card than this one. 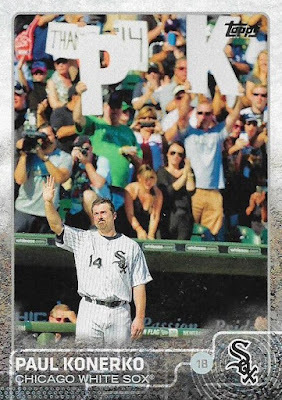 I know people like to call these "Final Tributes," but I think I like "exit card" better. That's what I'm calling these from now on. Thanks, U2! Track 11: Mothers of the Disappeared: Another song on this album about Nicaragua and El Salvador, specifically about a group of women whose children were abducted by their own government (stuff like this still goes on in countries. And we think we have problems). The easy choice for a Nicaraguan native is Dennis Martinez. But I'd rather show Nicaraguan Porfirio Altamirano. His career was short, but not only is his name fun to say, but I adored this card when I first saw it. 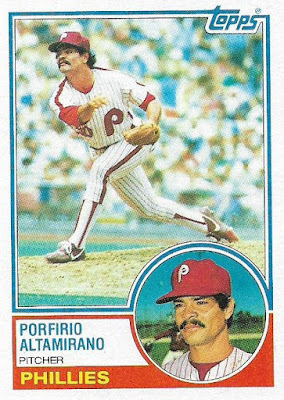 Still one of my favorite '83 Topps cards. I think the best thing I can say about this album is how I've treated it since it was released. Music is now digested in bite-sized quantities. Songs are pulled off of albums as we consume our music digitally without any respect for the story an album tells. I'm as guilty of this as anyone. But I haven't done that with The Joshua Tree. I listen to the songs only intact with the rest of the album. It just seems like something I'm supposed to do. I wish I could be at that concert, But I am very thankful for youtube, particularly in the last few months. It is a music-lover's dream. In fact, thanks to a recent obsession born of youtube, there will be another Match the Song Title within the next few months. It may surprise you as it steps outside the bounds of late '70s and '80s rock/pop. What can I say, I've come across a lot of music over 50 years. Awwww, isn't little Corey cwute? I'm still in decompression mode. I'm also in need of clearing a few cards out of the way so I can make room for the growing backlog of cards that I need to send people (the approaching drumbeat of September is just the best). So I've got a few small packages from people here that go nicely together because I say they do. 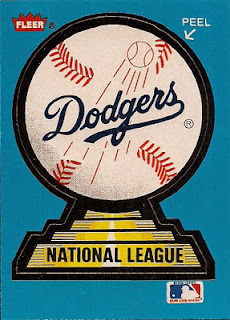 For starters there was a Seager-centric envelope from Not Another Baseball Card Blog. 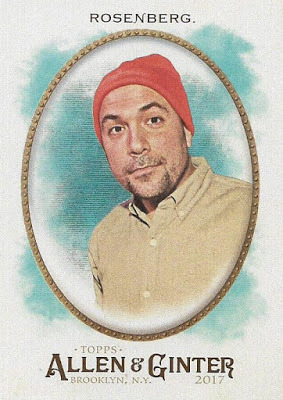 Two of the three cards in it were cards of the Dreamy Corey. 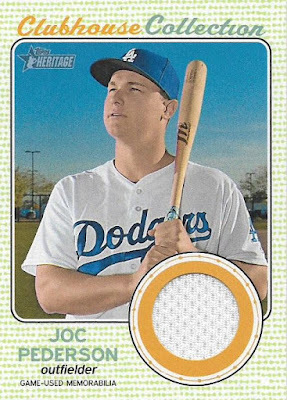 (Dodger Twitter folks, almost all of whom are vastly younger than me, are fond of saying "Damn, Corey" when Seager does something well. I will never understand people vastly younger than me -- or at least people vastly younger than me who write Dodger things on Twitter). 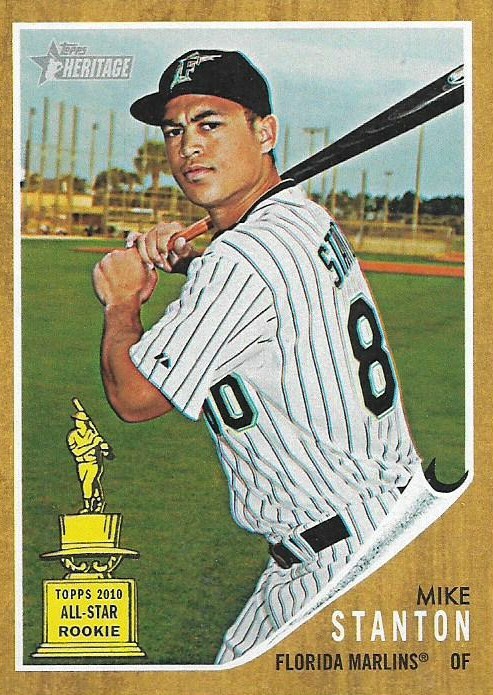 The main card -- the card that intrigued me -- was something Mike pulled from a repack box, I believe. It is a card with a Beckett Baseball magazine theme. This image was the cover of the May 2016 Beckett, I believe. Although I was never a Beckett Baseball magazine devotee (I predate the peak years for that publication), I've always loved magazine designs on cards and I knew I had to have it right away. As you can see, whoever issued this (did it appear inside the magazine?) numbered it to 5,000 -- old-school '90s numbering!!! The number notation leads me to believe this is considered the back of the card. 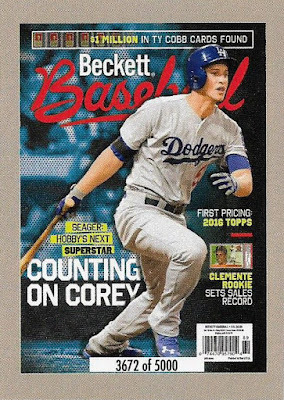 Because the reverse side features a Beckett Baseball magazine cover of Gary Sanchez, the issue from November 2016. 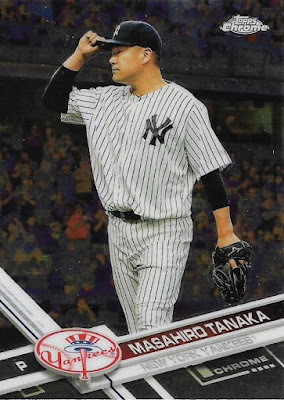 No, you're not going to see it because I don't want to show a Yankee. And you can guess what side will always be face down in my binder. Moving on to a single-card package from Henry. Henry responded to my plea for someone to take my abundance of Anthony Rizzo relics off my hands. 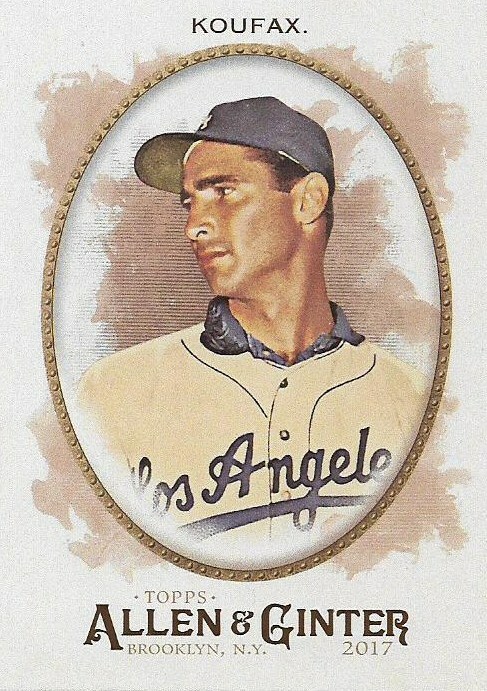 I was so eager to unload them that I traded a relic of an established star for a relic of a player who's offense is so screwed up he was recently sent down to figure himself out. There's no explaining team devotion, huh? Anyway, this makes me much happier than having Cubs in the house. Plus, I'm pleased to let those of you who don't know already that Henry has started his own card blog, called Cardboard Greats. Henry's a Red Sox fan (hey! no moaning, you were expecting a Marlins fan? ), and I've traded with him a couple of times now. Let's move on to a few cards from Allen & Ginter maven Matt from Bubba's Bangin' Batch of Baseball Bits. 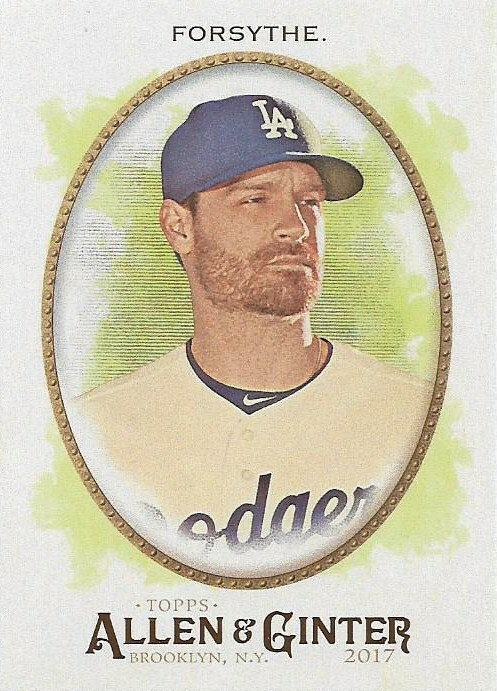 Matt sure likes the word "B," but beyond that, he likes Allen & Ginter -- a lot. And that's a collector I can appreciate. I'm happy to receive some of his leftovers after busting a case of the stuff. 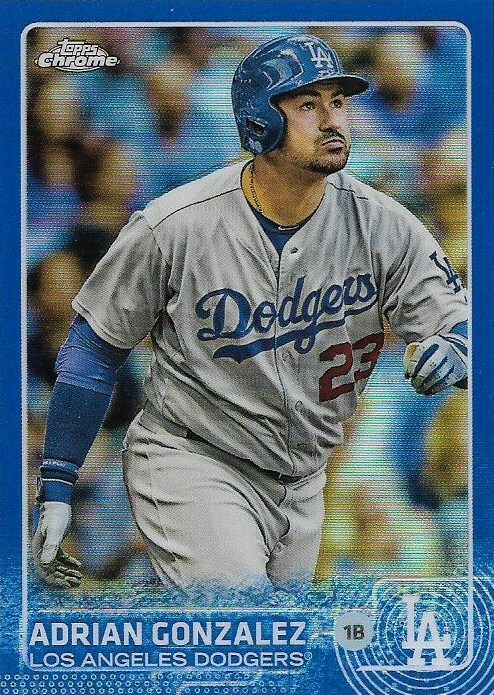 Those leftovers were heavy on Dodgers, of course. 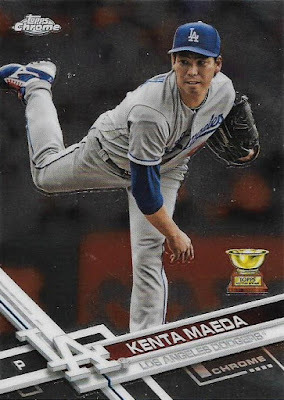 The only non-need was the Jansen card, which is a short-print. 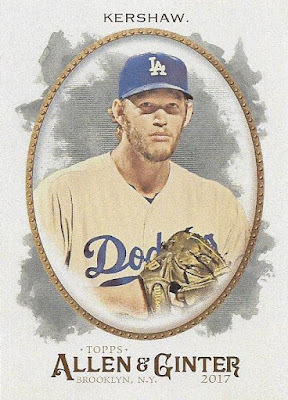 As I've said a few times, I'm convinced that certain A&G shortprints are just as plentiful as regular base cards, and probably the most frustrating thing about collecting A&G (it's actually not all that frustrating). The Forsythe was the last Dodger SP for me to corral and weirdly I still need a few base Dodgers. 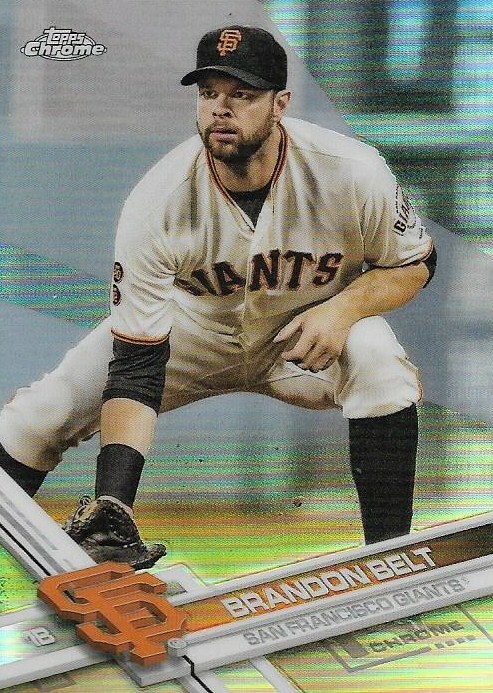 This, I thought, was a base need fulfilled, but it's actually one of those foil parallels. 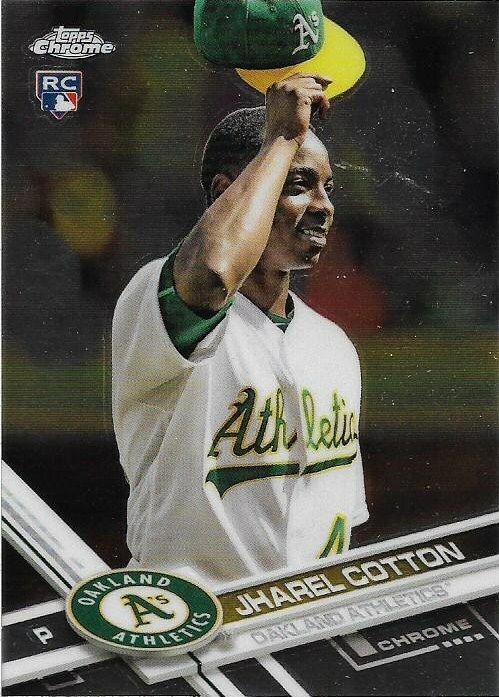 It looked like a regular card to me, but I was tipped off by the fact it was placed in a toploader. 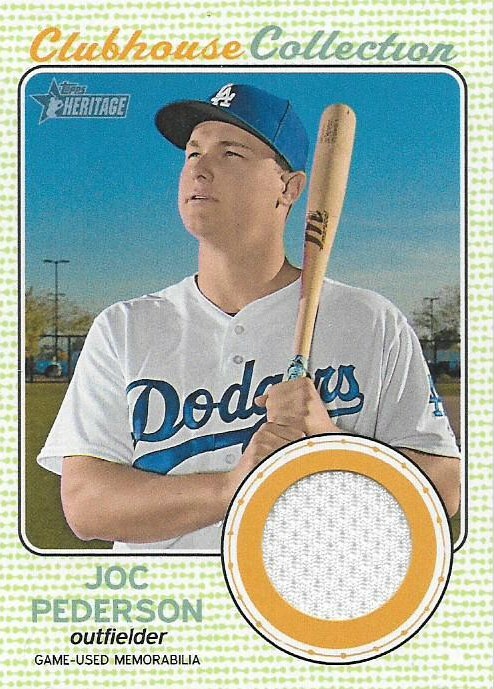 Good thing, because I already confused the Joc Pederson foil parallel for a regular card and had to go through the shame and humiliation of crossing off a want only to write it back in. Never let this happen to you! 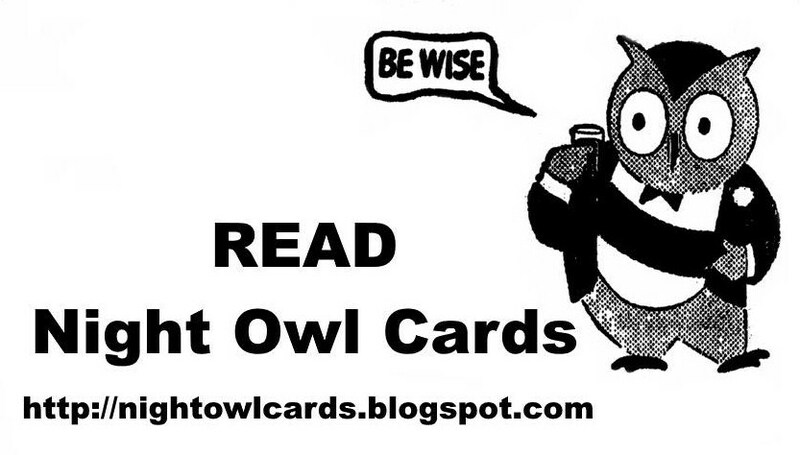 Always tilt your cards, even your A&G cards now! The scourge of foil is everywhere!!! A couple of mini Dodger needs also showed up in the package. And a dude, dude. 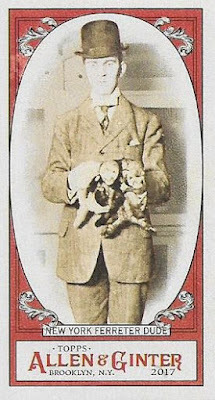 This one is holding ferrets, which I don't really recommend. Is this dude dreamy? I'll let you make that call. Matt also sent me a card of sideline reporter Alexa Datt with a query on whether she was this year's A&G Babe of the Year. 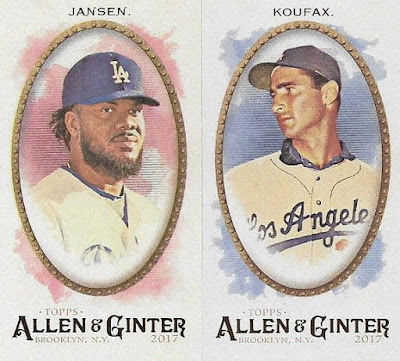 This makes me wonder whether this is the first married couple to have their own separate cards in the same A&G set. So, back to the A&G Babe o' Year. Datt is a cutie, no doubt. She's got a quick wit and a smart, sharp personality that works in New York. But you have to remember A&G has doubled down on the comely, young sideline reporters the last few years. 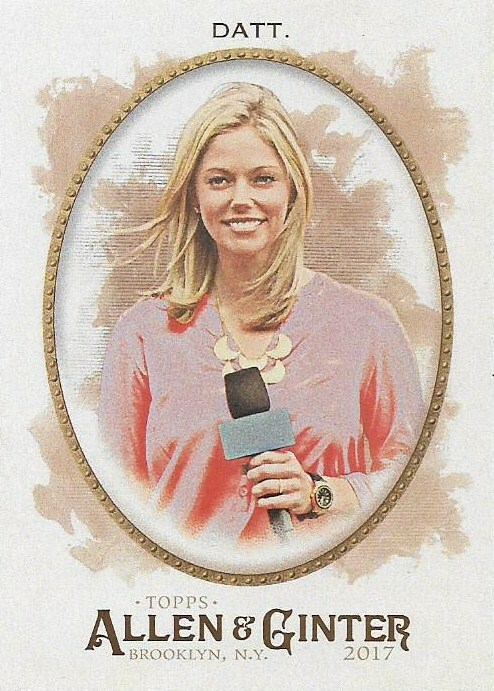 How do I choose between Datt and Allie LaForce? Also, Sage Steele is in this set. There are attractive media women everywhere! Fortunately, I don't have to choose between them, because have you seen Randall Cunningham's daughter??? Vashti Cunningham conquers all. 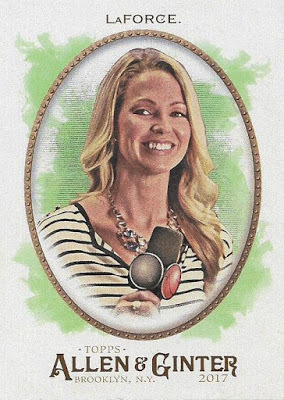 I don't have her card yet, but when I do, I have card of the A&G Babe of the Year. All right, that's enough objectification of guys and gals. 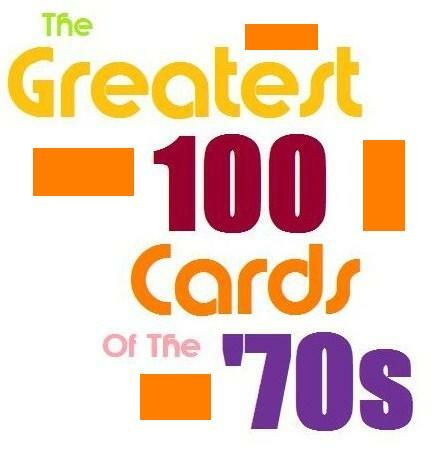 One more card and I'll let you get back to something more constructive. This also showed up from Matt. 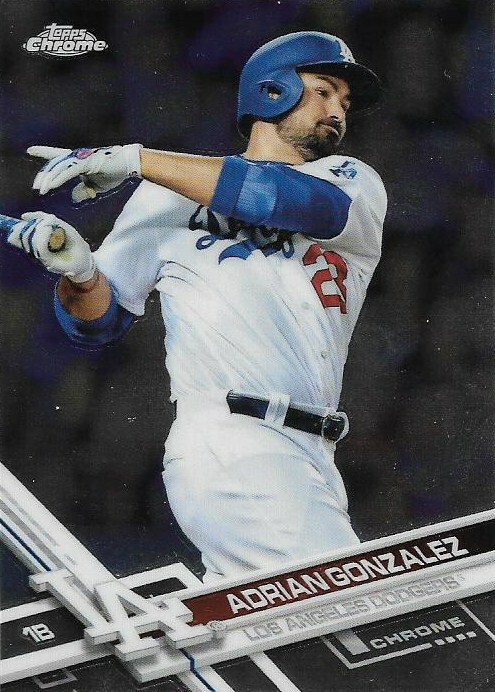 (Sometimes I'm surprised he has anything other than A&G cards). 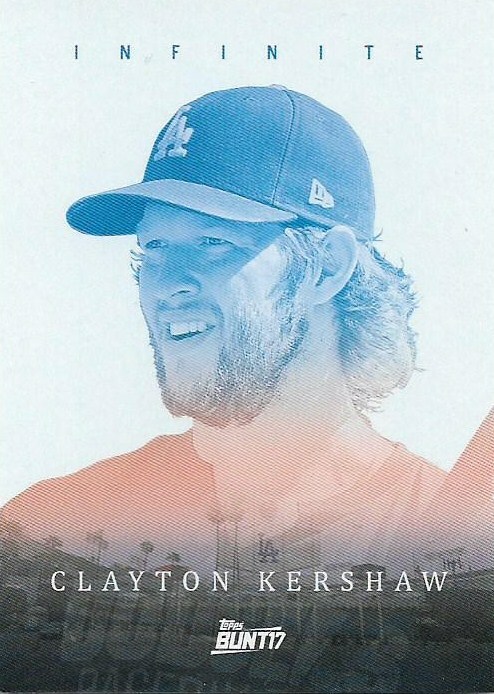 It's another of those weird Infinite cards, but it's a Kershaw card so I'm thrilled. It's also my 524th Clayton Kershaw card, and, gosh, that's an abnormal amount. Someone could make the case that it's an objectifying amount. Anyway, Kershaw is back on the Dodger mound this weekend, and I find that very exciting. I just finished producing the annual high school football special section for the newspaper. It's always a month-long project capped by a day-long finale that's sure to drain from you any will to be productive for the next 48 hours. I have the energy left to show just two cards. Fortunately, when I came home, there was a plain, white envelope sitting on the dining room table that contained -- unbelievable -- just two cards. The cards arrived from Joe, who has sent me many nice cards in the past. It's been awhile since I've heard from him, but I'm glad to learn that he's still collecting. It's some very fancy stuff, by the way. 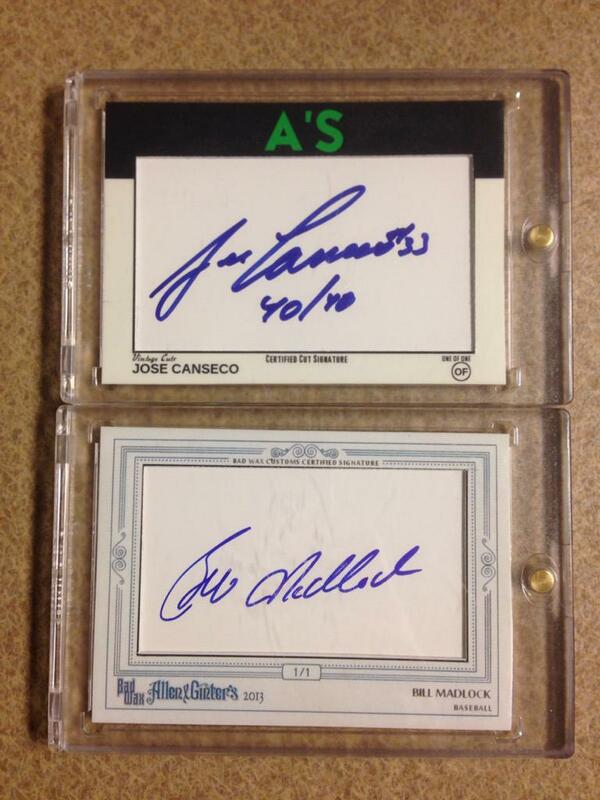 And speaking of fancy, if you're going to send two cards, then this is the way to do it. This is my first "book" card. It's two mini cards, so that makes it a mini book. But I'm not complaining. 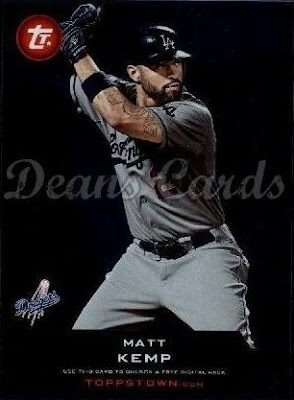 What I will complain about is how card companies never see the problem with pairing up rivals on the same card. It's like their employees never rooted for a team in their lives. 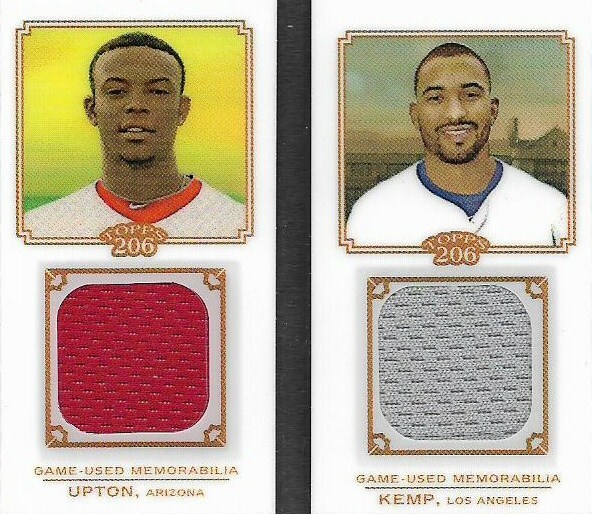 I don't like Justin Upton. 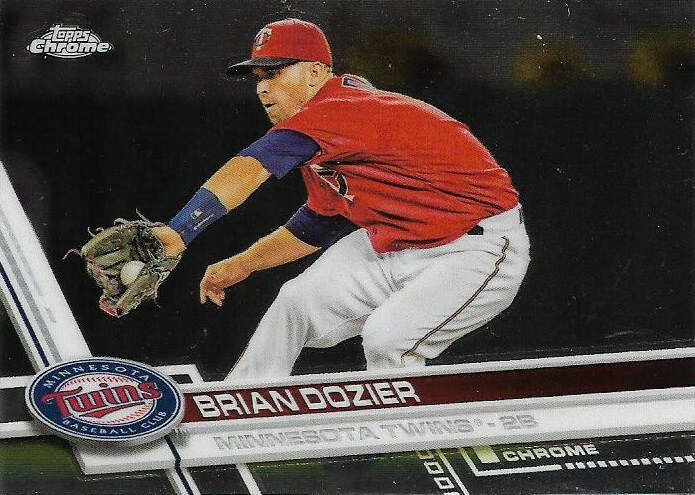 It has entirely to do with his time with the Diamondbacks. 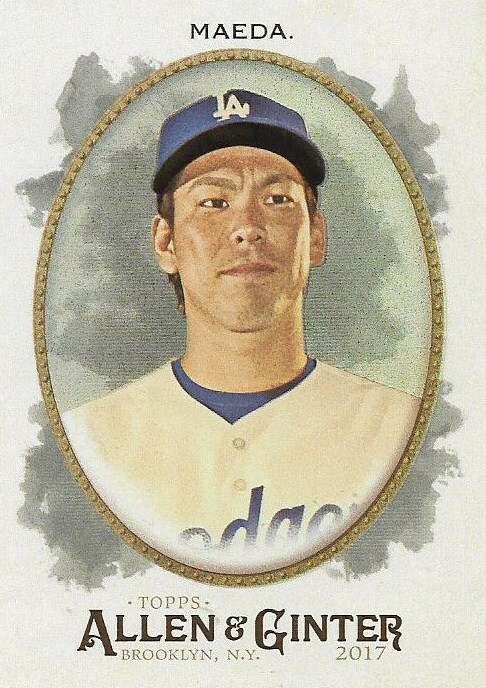 He does bad things to the Dodgers. 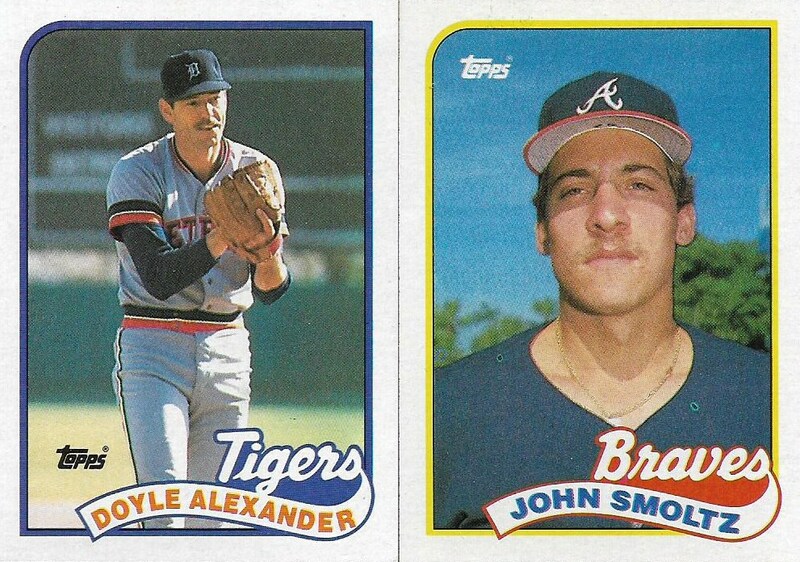 Then he played for the Braves and the Padres, for crying out loud, and did things all over again. 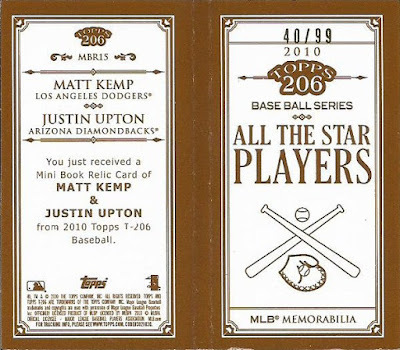 And when the Dodgers recently played the Tigers, there was Justin Upton again, doing bad things to the Dodgers. I had all kinds of flashbacks. Just get that guy away from my team. Anyway, it's from 2010 Topps 206 and very fancy. That's the reverse. All serial-numbered as all get-out. 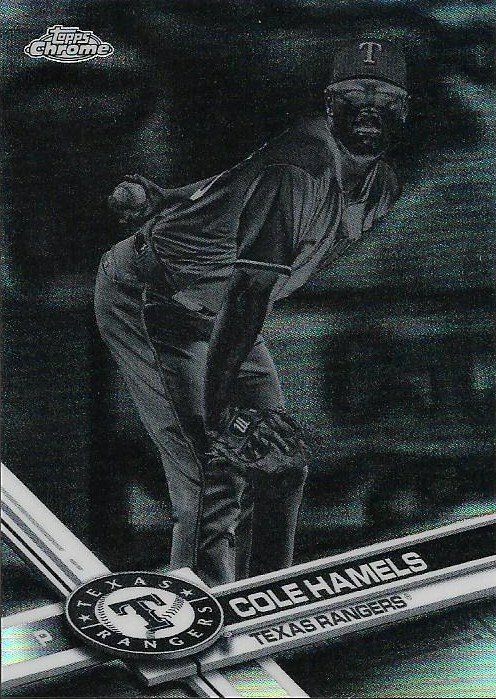 Pretty cool, and, no, I will not cut this card in half, no matter how tempted. 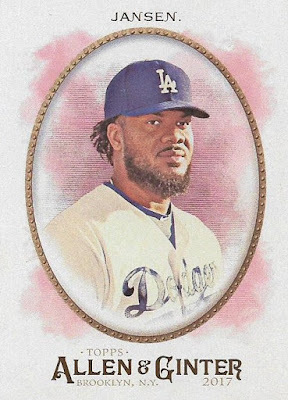 OK, let's move on to the next card. 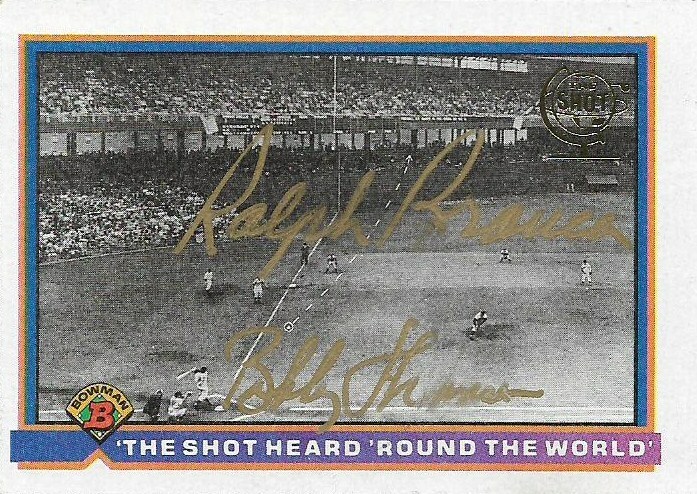 That's a 1991 Bowman card depicting Bobby Thomson's home run in 1951, signed in gold by both Thomson and the pitcher who gave up the home run, Ralph Branca. That is one hell of a way to spruce up boring old 1991 Bowman. 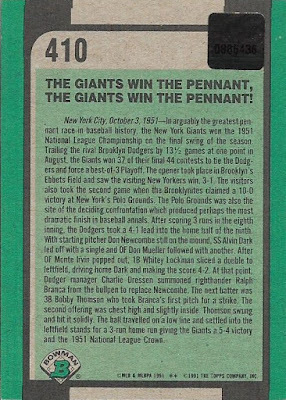 I don't fully know how this was issued, whether it was inserted into a later set or what. There is a stamp on the reverse that seems to indicate it's official? By the way, never mind that stuff about the Giants supposedly winning a pennant. We all know they cheated. So there you are, two fancy cards -- although I seem to have issues with both of them. You sure know how to send just two cards.